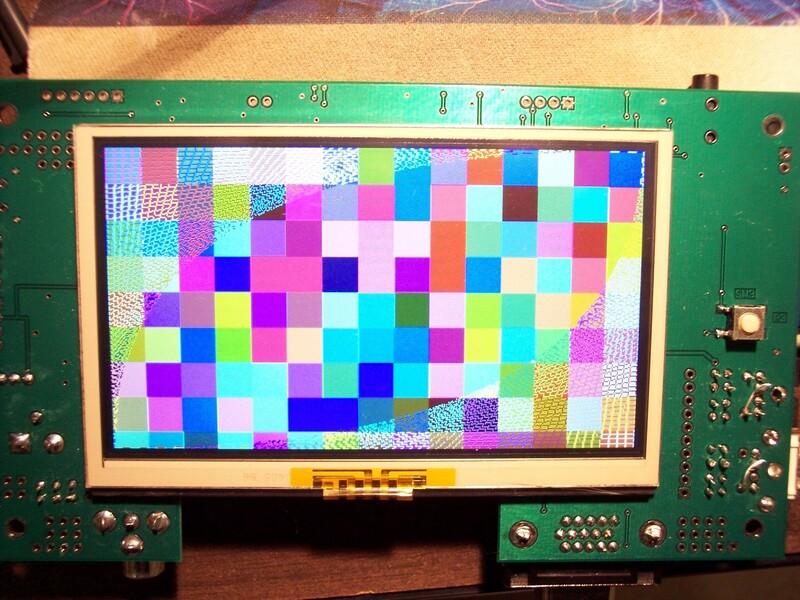 New 4.3" touchscreen LCD for Propeller: "used" screens almost free w/purchase. These displays will soon be for sale on my website.· There are two varieties:· "As New" and "Used".· The "As New" ones have had their touchpanels replaced and really are as good as new.· These will cost ~$30 ("As New" displays being held for PSB boards).· The "Used" ones may have a few minor blemishes but will cost less. 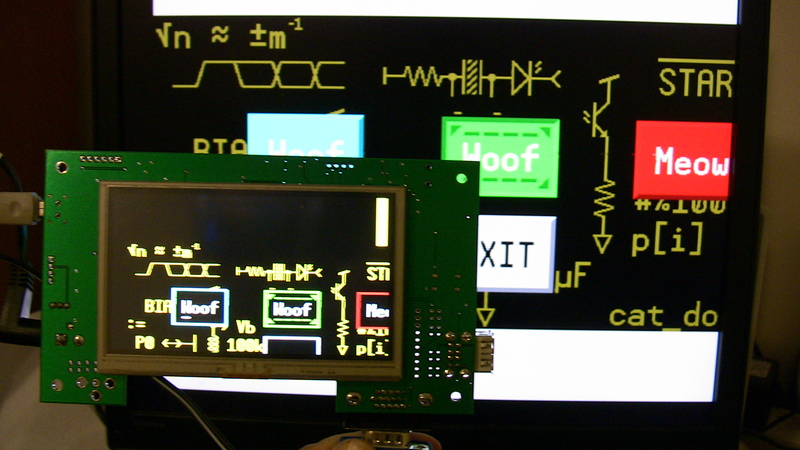 I'm going to provide full details (schematics and code) on how to interface these displays to the Prop.··I have modified·the standard VGA driver so that we can show text and images on the display. 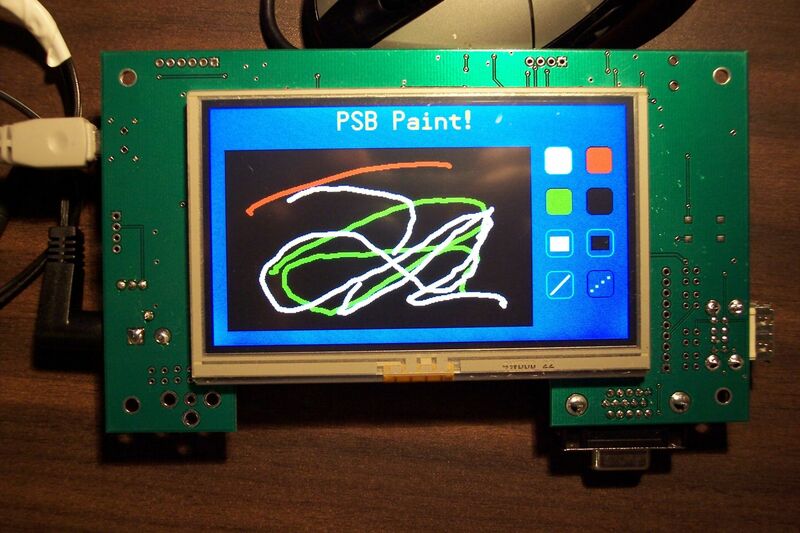 Update: A used screen is now free with breakout board or PSB purchase. If you wish to order some, send an email to ray@rayslogic.com with your your order. 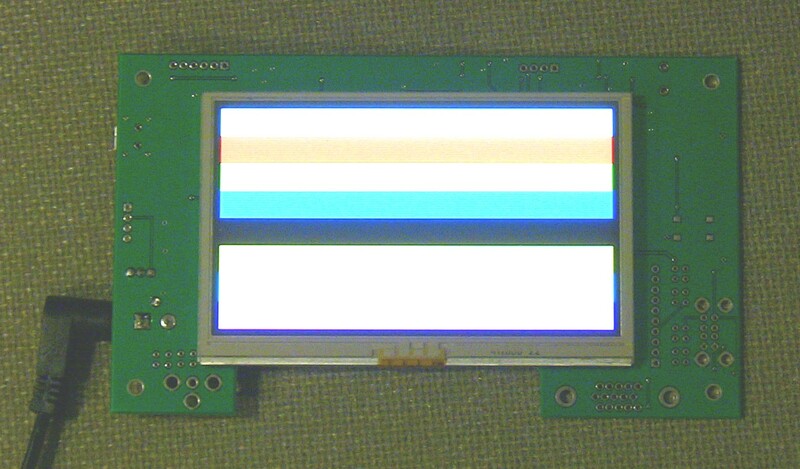 Due to limited supply, LCDs are now only sold with a breakout board, but you may get up to 2 LCDs for each breakout board. Revised source code for Paint and VGA demo apps on page 10! Breakout board schematics and layout on page 4! Niiiiccceeee. Would be a neat interface for my home security deal I'm brain-storming now. Sounds great.· What kind of connection do these use?· Is it one of those flexible leads that require a special socket? It is a 60-pin FPC connector.· The pitch is 0.5 mm. I ordered 2 of these displays (from that auction site), I'd from you but shipping is just not cost effective, sorry. A method like Bill Hennig's may be the way to go to get many colors. What do you think ? It's Only A Stupid Question If You Have Not Googled It First!! You are right, large color LCD's do need expanded memory, and ideally, a dedicated processor. 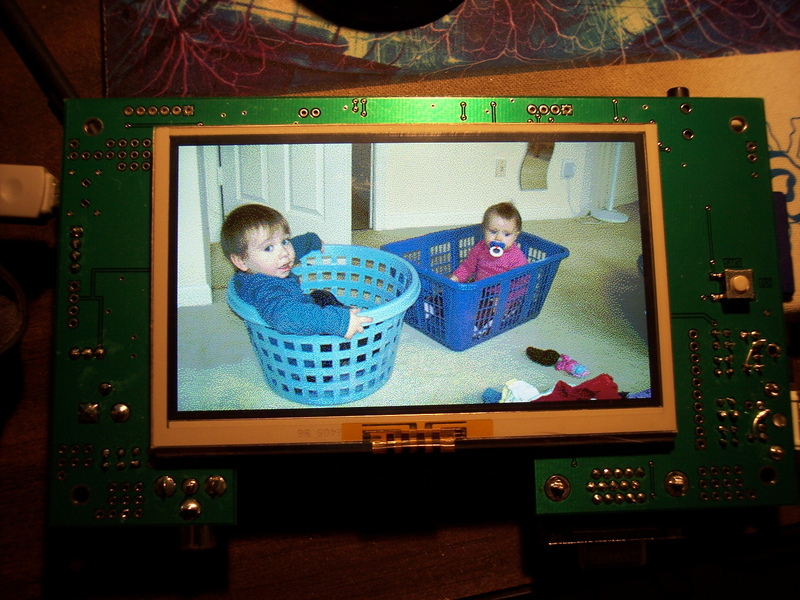 Eventually I will make LCD boards for Morpheus/Propteus, but that is months away at best. I am looking forward to looking at your design! Rayman, I picked up one of those lcds at the expo, and i was wondering if this breakout board had the right type of connector. 4. The connectors generally give a thickness of FPC they can work with, but I'd guess it'd work. Ray can we order direct from you are you going to post cost and can you also just include the connector for a price of course but just get everything from you??? Well done Rayman you do very nice work, still over my head on the Prop. Cool. I like reflective screens. Would be fun to hook to 1 of my super props. Want to make projects and have Gadget Gangster sell them for you? propmod-us_ps_sd and propmod-1x1 are now available for use in your Gadget Gangster Projects. Need to upload large images or movies for use in the forum. you can do so at uploader.propmodule.com for free. Just finished a driver for the display! 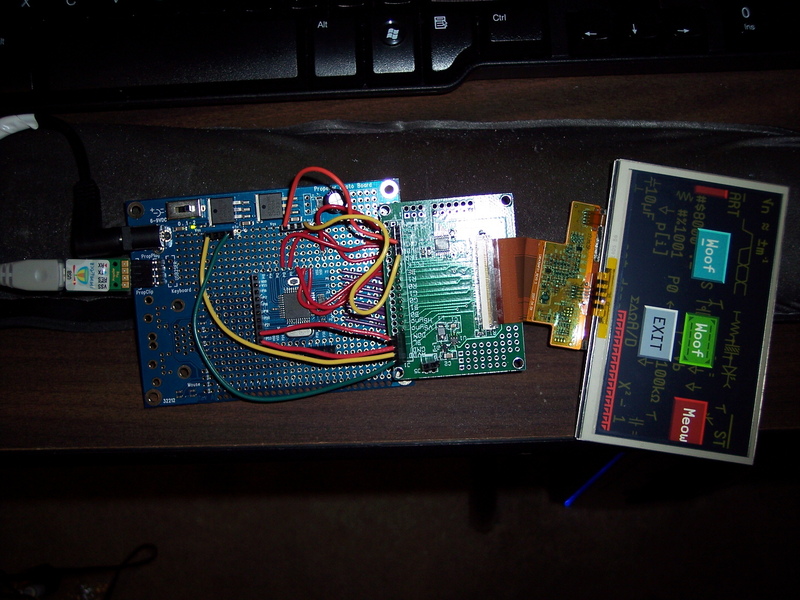 It works just like the VGA driver (basically, I just hacked the Parallax VGA driver to give the proper display). (I was supposed to tie the 6 Prop color bins to the 2 most significant bits of all three colors, but I instead wired them to the 2 least significant bits...· End results is that I only have 8 colors instead of 64 colors.· But, this will be remedied in the next revision). Ray, are you posting your driver for the LCD anywhere? 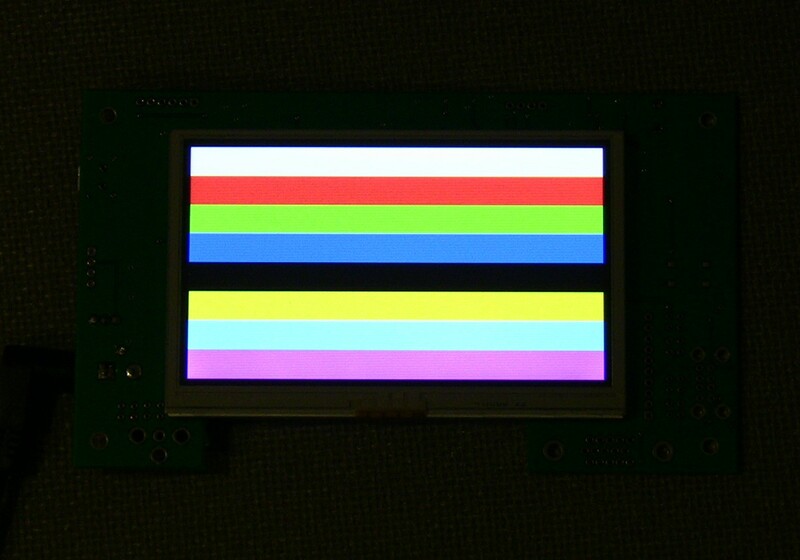 I ask because I've been working on propellerizing the Philips PET720 DVD display, of which I have a couple, and it uses a RGB interface with NTSC-like timing that reverses the polarity of the signal each scan line. It's the same pixel resolution as yours and I suspect the driver requirements might be similar. Awesome! I think that as soon as there is a breakout board I will buy a used one and a breakout board. The used one should be budget-friendly. If it's not Parallax then don't even bother. Nice work, Rayman!· Your persistance is amazing.· Thanks for the progressive updates.· I thought you'd run into a deal-breaker, but apparently not. 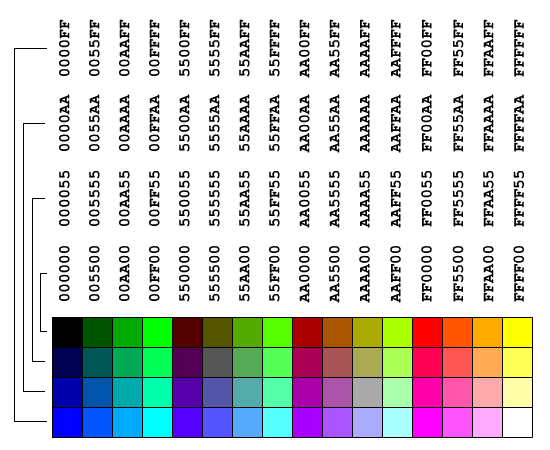 For what it's worth (probably not·much, but just for fun) and for anyone that's interested, I mocked up a graphic (.png & .gif from Adobe Flash) showing the 64 colors you'll be able to display once you use the 2 most-significant bits for each of the RGB colors (I believe the .png conversion preserved the colors well, if not perfectly).· I haven't dove into the VGA driver much yet, so I'm not completely sure if these are the exact colors it generates, but I would guess so (or nearly so).· In the attached graphic, the colors are shown in a 4-Row x 16-column grid in a numerically increasing format, first from top-to-bottom and then from left-to-right, with 24-bit RGB colors values shown in HEX displayed above them as indicated by the lines to the left. Offhand, I forget how many bits-per-pixel your new display has, but if it's 15, 18 or 24, then the colors should appear like·those in the graphic below.· However, if it's a 16-bit display, colors would be a bit different.· I know you know that already; I'm just stating it for the convenience of others curious about what colors will be generated.· Overall, it's a fairly decent color set, but, as one can tell from the graphic, the colors are not distributed as evenly across the color spectrum as one would probably like.· That is, many of the colors are close together in hue.· If hand-picking a palette, one would probably make some different choices, but the major colors would still be the same.··Anyway, this is the set of colors that one gets if using·the 2 most-significant bits for each of R, G & B, and·the set is·not bad and probably more than suitable for many Propeller-related purposes. For your colors to match these, you'll (of course) have to tie the "lesser-significant" color data pins to the 2 most significant bits in order to cover the spectrum from full black to full white (and thus match the colors in the graphic).··For example, looking at just one color, say red, for a 24-bit display,·one would run·2·color data bit from the·Prop to the 2 most-significant bits of the display (Prop MSB-to-DataBit7 and Prop 2nd MSB-to-DataBit6, of course), then color data bits 5, 3 and 1 of the display would be tied to DataBit7 of the display, and color data bits 4, 2 and 0 (of the display) would be tied to DataBit6 (of the dispay).· Again, you're well ahead of me on this and no doubt are already configuring the new board this way.· I've never actually done this, but that's the way I believe it's supposed to work (it makes sense and I've seen LCD data sheets with similar recommendations).· Okay, I guess that's enough of stating the obvious for one day.· Anyway, good luck with your exciting endeavor. Update:· I added a drawing to illustrate the last paragraph (1 Pic = 1000 Words).· Incidentally, a·design using serial-RGB would be similar, but only 2 bits would go in at a time, so only 1/3rd of the drawing would be used (for example, the red circuitry, only it would be used·for R, G & B sequentially). What changes did you make to the VGA driver in order to make it work? 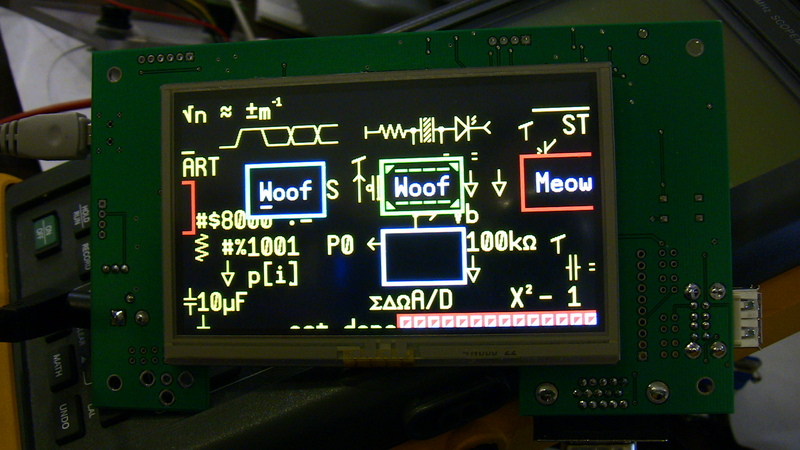 JRetSapDoog: I was thinking of a different wiring scheme, but I like yours better! I had a harmless/superfluous connection dot in the LCD drawing, which I've now edited out. When you say that the board draws 420mA with full backlight, at what voltage is the board (3.3V or 5V)? I'm curious about total power consumption. 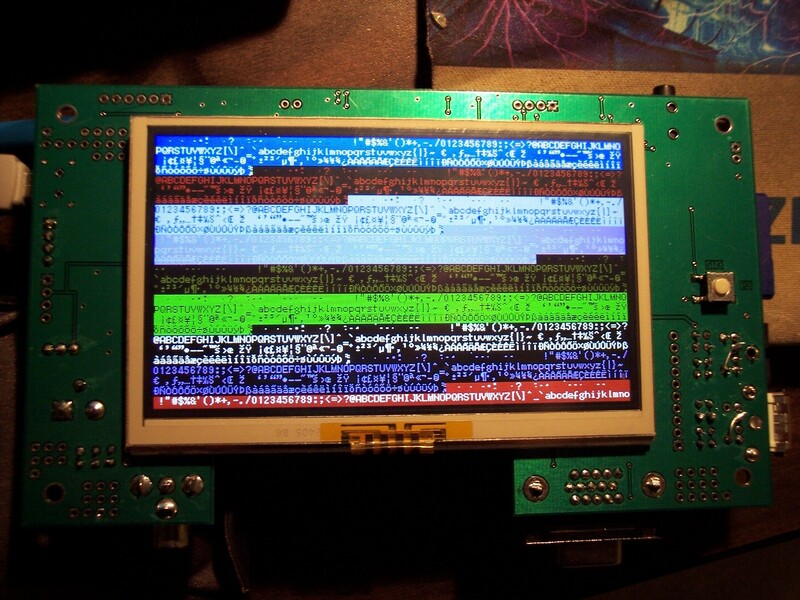 For the actual LCD driver, how many cogs are involved, one or two? I'm also curious about your final frame rate and the degree of perceptible flicker. I think I'll pick 8 or 10 MHz for the driving frequency. Sounds wonderful! You're the ray, eh...I mean the man. Okay, maybe both. Yeah, probably not the first time you've read that with your 2100+ posts. In following your work, it seems like you take an open-minded and optimistic approach to your design experiments. I should learn from that. I would have thought that one would have had to have precisely calculated all that timing stuff--front porch, back porch, data hold times and what not--before conducting a test (and perhaps you did or estimated things), but you seem to be able to work magic by quickly varying things in code and just trying a range of parameters.· Hmm...considering how flexible that display appears to be timing-wise, now I'm kind of wondering just a little bit·if it's a standard "raw" RGB display.· It seems like one of the pics showed it attached to its own PCB.· Guess I should dig up one of your related threads·for the display data and look into that, but I'm still assuming that it's a fairly standard·display in terms of operation. Anyway, let me go take a patience pill and stop distracting you from your work and progress (but please do keep us in the peanut gallery posted, as you've been doing). I have been looking for a slightly larger touchscreen like this for a while but cannot find any cheap suppliers. Do you mind me asking when you find your supplier?